The programme of the Cortina Snowboard World Cup – Night Event 2018 is ready and full of news! This year the Giant Parallel (PGS) is back on the slopes of Cortina, and we decide to make it the main and only event, since the great success of the past edition! Special Guests: Italian National Team Snowboard and the TD Cesare Pisoni. 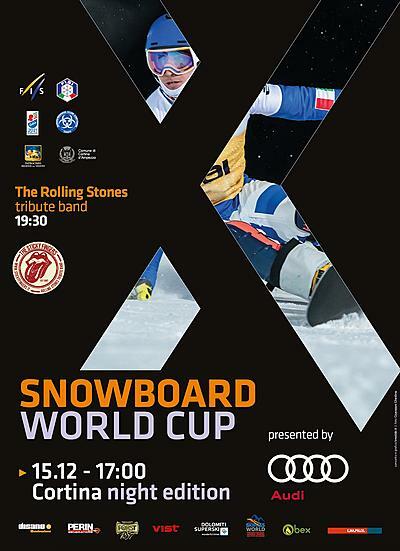 Snowboard World Cup athletes come to Cortina d’Ampezzo! 7:00 Team Captain's Meeting @Alexander Girardi Hall. Follow party and fun along the centre of Cortina! 9:30am the Bring Kidz to the Snow, the international kids’ competition, is back in Cortina on the Franchetti slope Faloria! From 1pm to 3pm Qualifications of PGS on Tondi slope Faloria! 5pm PGS Finals on Tondi slope Faloria! 7:30pm Live Concert Sticky Fingers, Rolling Stones Tribute Band @Rifugio Faloria!